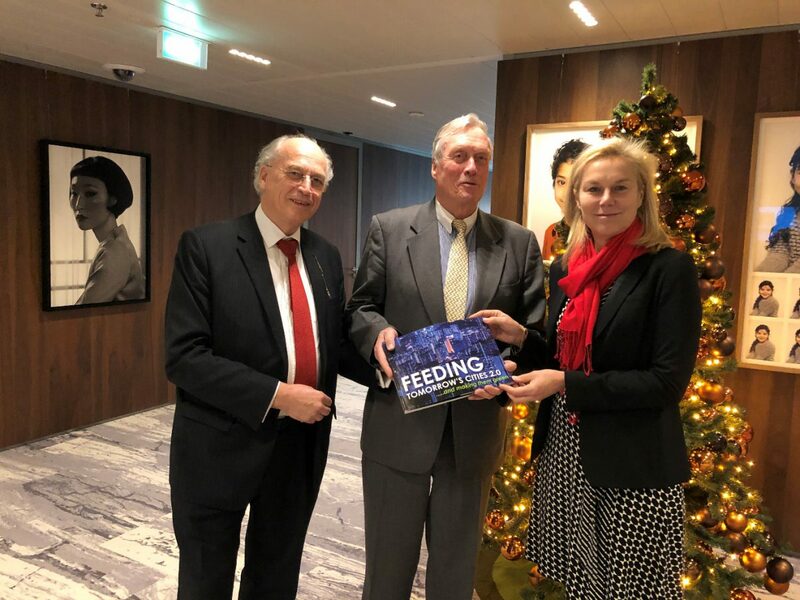 On Friday December 14, 2018 the first copy was presented to the Netherlands Minister for Foreign Trade & Development Cooperation, Mrs Sigrid Kaag. She complimented MFS with the document and showed herself keen to use and work with it. Subsequently, on December 17 the publication was presented to Dir.Gen Agro of the Ministry of Agriculture, Nature and Food quality. Ms.Marjolijn Sonnema. Chairman Hans de Boer of VNO-NCW, the Netherlands Employers organization, followed suit and expressed his “admiration and respect”. He was instrumental in presenting “Feeding Tomorrow’s Cities” first edition when co-chairing a round table with top-leaders of Chinese enterprise in the presence of His Majesty the King, first-day-event of the Royal visit to China in October 2015. The book was also presented to the dept. DG – Rijks Voorlichtings Dienst (RVD), the Director Int. Business of the Ministry of FA (Directorate General Foreign Econ. Relations), Mr. André Driessen, Director of RVO (Rijksdienst voor Ondernemend Nederland) Int. Programmes, Mr.Tjerk Opmeer, and the DG for Enterprise & Innovation, Mr. Focco Vijselaar, Ministry of Econ. Affairs and Climate. 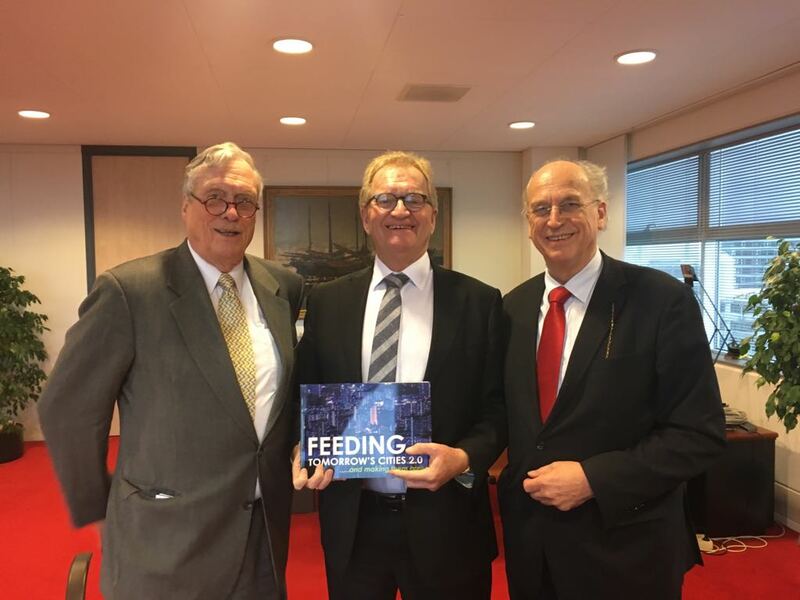 The last week of January ’19 provided an opportunity to acquaint a number of Heads of Mission who with the content of “Feeding Tomorrow’s Cities 2.0” . At the annual Ambassador’s conference in the Hague some 40 copies were presented to interested participants. RVO was helpful in lending its hand and in distributing copies to the worldwide network of agricultural bureau’s. In October 2018 MFS participated in Algiers in the Algerian-Dutch Forum on Agro, Food and Technology, in partnership with CAAN, the Conseil d’Affaires Algéro Néerlandais. It preluded the 18th agro-exposition SIPSA-SIMA that was opened 2 days later, with the Netherlands as honorary participant and some 20 Dutch companies present. In May 2018 MFS and NAFTC Africa/ME were visitors to AgriVest and AgriTech , Tel Aviv, Israel . The Minister for Agriculture, Nature and Food quality, Ms. Carola Schouten, and Wageningen (WUR) President, Ms. Louise Fresco, presented keynote speeches. More than 20 companies participated in the trade mission. A number of them were also present at the trade-fair, which provided the delegation with an opportunity to meet Minister Ms. Schouten. Approximately half of the Dutch delegation subsequently paid a visit to Jericho to meet with new and old trade partners from the Palestine Territories. Minister Schouten and Ms. Fresco were briefly present at the opening. A subsequent visit to Egypt attracted a largely new delegation of some 20 members. A substantial and well-attended high level seminar was followed by matchmaking and a visit to three Nile-delta companies. Land development was one of the issues discussed. The topic has been taken up again in the framework of the Cairo “Food Africa” exhibition, early December ’18. In the meantime plans are being developed to expand the relationship between Sanec (South Africa Chamber of Commerce) and NAFTC-Africa (MFS advisor) into a Federation for Netherlands-Africa Econ. Cooperation (Fanec), CAAN being among driving participants.